LOOKING TO REPEAT … With a solid nucleus returning, the Locos look to bring home another BBC title. Key Returners: Dakota Benner (P, C, INF), Tanner Sanders (P, OF, INF), Bryer Bentley (P, C, 3B), Brock O’Neal (3B, OF), Tyler Rupp (2B, OF), Tylor Yarhaus (INF,OF), Brayden Custer (P, INF, OF), Connor Yarhaus (1B, P), Jace Norrick (P, INF, OF), Collin Crisenberry (P, OF, INF), Blake Altaffer (P, INF, OF)The Locos will have one of the strongest pitching staffs in the BBC as they have several players that can provide innings which is an important thing to have with the pitch count rules. “I think having good live arms will be a strength even though it’s hard to say since the kids have been mostly in the gym”, said coach Toby Hutchison. “I think hitting will be my major concern this season. We only hit .268 as a team last year so we have to focus more this year on being a good contact hitting team”, explained Hutchison. “Our league is always competitive day in and day out. If we play to our potential, we will be very competitive”. 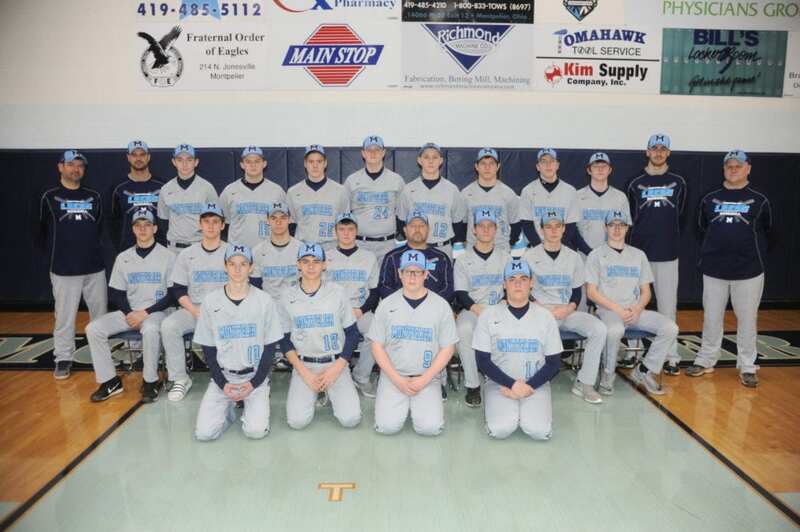 A combination of quality pitching and solid team chemistry has Cadets head coach Tony Gerig very optimistic entering the 2019 season. “We have a number of arms that we feel like can be very competitive on the mound for us day in and day out. Team chemistry appears to be better than what it has been in quite some time. With arms to keep us in games and a group of guys playing for each other we look to continue our run of competitive baseball”, continued Gerig. “We do have a lot of turnover on our roster so that brings some unknown. It will be interesting to see how our kids respond having to replace so many spots from a year ago”. In regards, to the BBC race, Gerig sees Montpelier as the favorites with so many players returning from their league championship team last year, but Stryker, North Central, and Edon will also have solid teams. Key Returners: Logan Boetz-Sr., Daniel Fether-Sr., Alex Grice-Sr., Izayah Ferguson-Sr., Luke Holsopple-Sr., Thomas Bost-Sr., Tristin Sampson-Sr., Reece Hall-Sr., Izayah Littin-Sr., Gavin Campbell-Jr., Noah Huffman-Jr., Kaleb Holsopple-So., Payton Woolace-So. Promising Newcomers: Max Wonders-Jr., Wyatt Short-Jr., Joseph Ramon-So., Brandon Bowers-So., Joshua Rodeheaver-So., Devon Weirauch-So., Cameron Wonders-So., Logan Stuckey-Fr. According to coach Brett Grieser pitching and defense will be the key to success for the 2019 Stryker Panthers. “We look to improve as a team on a daily basis. It will be important for our returning letter winners to play at a high level and get some contributions from our younger players who are entering the program. We will rely on pitching and defense to keep us in most games as we have a very tough schedule ahead of us”, Grieser elaborated. Grieser does expect another highly competitive season in the BBC. “There are numerous good athletes and coaches making up the seven programs in the league. Our league has proven that anyone can beat an opponent on any given day. It’s our goal to be vying for a league title the last week of the season”. Key Returners: Layne Cogswell-Sr., Dalton Joice-Jr., Colton Schmunk-Sr., Jack Bailey-Jr., Levi Williams-Jr., Zayde Van Auken-Jr. Promising Newcomers: Ben Turner-So., Brandon Baker-So., Zach Hayes-Fr., Sam Wheeler-Fr., Colton Hicks-Fr., Mason Sanford-Fr., Ryan Pfund-Fr., Roman Sutton-Fr. Coach Eric Smeltzer has six letter winners back and will look to them to lead this year’s team and help the young talent that is entering the program. “Our youth can be viewed as a strength and weakness”, said Smeltzer. ‘It is possible we will have young players in the lineup every day, so we’ll have to see how that plays out”. Smeltzer said this has been a very hardworking group and he looks for them to continue to improve and compete for the BBC championship along with making a nice tournament run. Experience, defense, base running, and pitching are all thing that coach Brien Moore views as strengths for the 2019 Bombers while improvement on offense is something he is looking for. “We bring three quarters of our team back from last year and we hope the experience we gained last year will lead to more success this year”. “The BBC is a very competitive baseball conference. Every team brings back a lot of experience and each conference game will be a battle. Montpelier is the returning league champions and they bring everyone back so I would have to say they’re the favorites”, Moore concluded. The Blackbirds will look to improve on last season’s 6-6 BBC record and will have to do it with an inexperienced roster. “Overall experience will be a factor for us with only two seniors on the field. Pitching depth is also an area we need to grow with Logan Rufenacht (32 IP) and Josh Horning (9 IP) our most two experienced pitchers”, commented head coach Paul Bishop. “Our team has been working hard and have been showing improvement every day in practice Rufenacht and sophomores Tommy McWatters and Brayden Barrett will anchor the infield at second base, third base, and catcher respectively. In the outfield, senior Devin Beltz will provide experience in one of the corner outfield spots and sophomore Josh Horning will cover a lot of ground in centerfield”. Promising Newcomers: Jaxen Wentz-Jr., Marcus Asbury-Jr., Ray Kope-Sr., TJ Molitierno-So., Brady Burrow-So., Quinn Mitchell-Fr., Owen Lemley-Fr. Fayette returns four pitchers as they look to build on last year’s 2-16 record. Head coach Matt Maginn will lean on his three seniors to provide leadership for the younger players. Maginn expects Montpelier, Edon, and Stryker to contend for the BBC title while he hopes his ballclub can improve on their two wins from last season. Be the first to comment on "Previewing The 2019 Buckeye Border Conference Baseball Season"